2019 Average Scissor Lift Prices (New, Used, Rental or Lease Rates): How Much Does a Scissor Lift Cost? No Obligation Scissor Lift Price Quotes From Dealers Near You for Free! A new, 19' scissor lift has an average cost between $10,000 and $16,000, with a used model costing between $3,000 and $6,000. Renting the same size scissor lift has an average cost between $100 and $150 per day. Leasing a scissor lift with a retail value of $40,000 has an average cost around $2,000 per month for a two-year lease. Costs for new scissor lifts depend on the type of lift, engine type, weight capacity, and maximum reach of the lift. A new 19' scissor lift has an average cost between $10,000 and $15,000, depending on specifications and type. 20' and 30' scissor lifts may cost as much as $50,000. 35' to 60' scissor lifts range in price from $20,000 to $75,000, depending on the features and specifications of the model. Get Free Scissor Lift Quotes Right Now! Used scissor lifts are almost always less expensive than new models, but prices vary based on the age of the unit, type of lift, specifications, operating hours, and specifications. A 19' scissor lift that sells for $11,000 new has an average used cost between $3,500 and $6,000. A used 30' scissor lift has an average cost between $7,500 and $15,000. On average, you can expect to save around 60 percent when buying a used scissor lift. Fuel: Scissor lifts are powered either by electricity or some type of fuel, such as diesel, gasoline, or propane. Diesel and gas powered lifts are commonly referred to as rough terrain scissor lifts and are primarily used outdoors, where their emissions cannot build. Electric scissor lifts are quieter and produce no emissions, making them ideal for indoor applications. 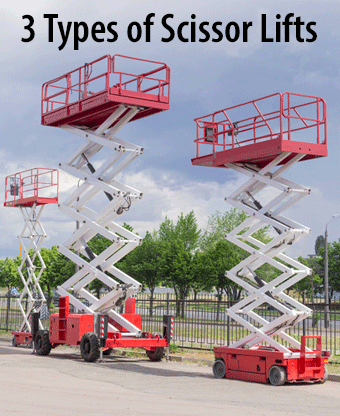 Height: It is important to know the heights you want to reach with your scissor lift before you buy. If you do not know how high you need to go, you may end up with a lift that doesn't reach your desired areas or spending too much on one with more reach than necessary. Most scissor lifts have reach heights between 20' and 50'. Weight: The weight capacity of the lifts determines what you will be able to transport up and down. Higher weight capacities often mean decreased reach height, so in some cases you may need to think about whether reach or weight capacity is the more important factor. The cost of renting a scissor lift depends on the size, fuel type, specifications, and the rental rate you agree to. In general, you can expect larger lifts and rough terrain lifts to cost more than their smaller and/or electric counterparts. A 19' electric scissor lift has an average rental cost between $100 and $150 per day, between $350 and $500 per week, and between $900 and $1,200 per month. A 32' electric scissor lift has an average rental cost between $120 and $170 per day, between $400 and $700 per week, and between $1,400 and $1,600 per month. A 32' rough terrain (gas or diesel-powered) scissor lift has an average rental cost between $150 and $200 per day, between $475 and $600 per week, and between $1,550 and $2,000 per month. Delivery and pickup costs average between $100 and $150. 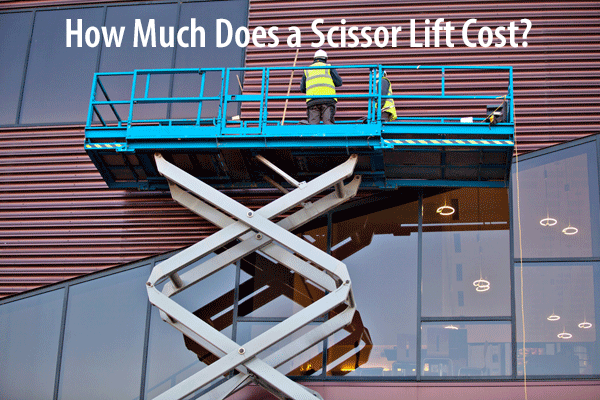 How Much Does it Cost to Lease a Scissor Lift? How High Does a Scissor Lift Go? Scissor lift heights vary from model to model, but the majority of working heights average are 20' to 40'. 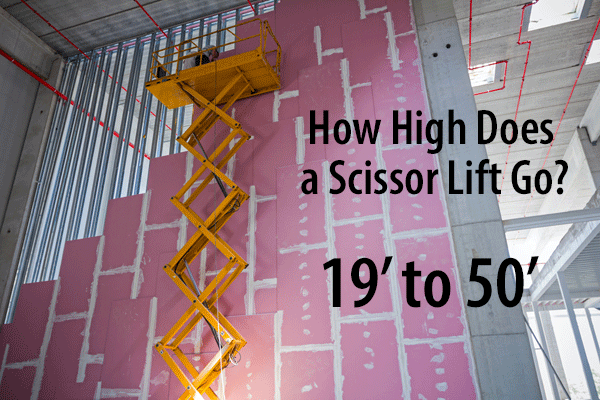 Weight capacities and other features impact the maximum height of a scissor lift. There are multiple sizes and lift heights available, so finding the right one for you is a breeze. 19' lifts: Ideal for tighter spaces, 19' scissor lifts tend to be narrow and are often used to access ceilings and ductwork. 26' lifts: With a working height of around 32' and wide platforms, these lifts can reach up to the third story of a building and carry the tools you need for the job. 32' lifts: These are often used in utility work, as the working height allows you to reach the top of a telephone pole with ease. 45' lifts: This size of lift is often used in painting jobs for larger buildings or for window washing. 50' lifts: Some of the largest scissor lifts available, 50' lifts allow you to access up to the fifth story of a building. Scissor lifts come in three main types: electric/diesel, hydraulic, and pneumatic. The type that works best for you depends on your workspace and your scissor lift needs. Electric/diesel lifts: These are the most common types of scissor lift and are used for various applications across multiple industries. Electric lifts are typically used indoors, as they have no emissions, while diesel lifts are typically used outdoors, as their emissions can build indoors and cause problems. An electric lift simply needs to be properly charged and maintained to run, while diesel lifts need to be refueled. There are also gasoline scissor lifts and LP or propane lifts. Hydraulic lifts: To lift loads, hydraulic scissor lifts utilize hand-powered or pressurized hydraulics. Hydraulic oil changes in pressure, which makes the platform move up and down. Hydraulic lifts are popular due to the decreased training required to operate them. Pneumatic lifts: Rather than using electricity, fuel, or hydraulics as a lift mechanism, pneumatic scissor lifts use air pressure. These lifts take in atmospheric air to move the platform and are the most environmentally friendly option. Though they are more expensive than other lifts, they require little maintenance due to minimal parts and no engine. Pneumatic lifts also work in just about any environment, because all they need to work it air.